Twelve persons, including two drivers and a child, died yesterday in a road accident on Abeokuta-Kobape-Sagamu road. The accident reportedly occurred when a speeding Kia Cerato car veered off its lane, crossed the median and rammed into a commercial bus on the opposite direction. All occupants of both vehicles were said to have died on the scene. The accident occurred around 1 p.m at the Siun stretch of the road. The remains of the 12 victims were reportedly deposited at the morgue of the Olabisi Onabanjo University Teaching Hospital (OOUTH) in Sagamu. The Kia Cerato car, which was said to be speeding, had a burst tyre. In panic, the driver was said to have applied the break and lost control of the wheel. This led to the collision with the Toyota bus travelling in the opposite direction. The stateâ€™s Public Education Officer of the Federal Road Safety Commission (FRSC), Mrs Florence Okpe, announced this yesterday. In a statement on behalf of the Sector Commander of the FRSC, Clement Oladele, the education officer urged the people whose family members travelled within the period of the accident to contact the FRSC Command in Abeokuta, the state capital, or the Olabisi Onabanjo University Teaching Hospital in Sagamu for identification of the victims. The statement reads: â€œA black KIA Cerato car on high speed suffered a tyre burst and the driver was suspected to have applied break suddenly, which led to him losing control of the speeding car that left its lane, climbing the road divider and racing to the opposite direction where the car collided with a passenger bus, a grey Toyota sports space bus. â€œThe bus was traveling from Abeokuta towards Sagamu. 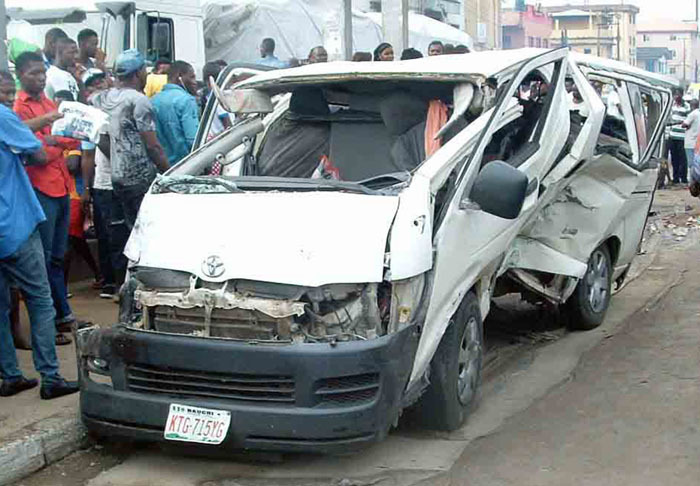 The unfortunate crash killed all the occupants of the two ill-fated vehicles. The suspected cause of the crash is tyre burst and speeding. â€œThe details of the two vehicles are: LSR 334 FF for the Toyota sports space van (ash) and the second vehicle is marked (Lagos) KJA 806 BT, KIA Cerato, black colour. â€œThe people involved are 12 male adults, six female adults and a child). The dead victims were taken to OOUTH mortuary in Sagamu.